If a judge sides with the family, it could lead to Jahi being cared for at state taxpayers’ expense — though Dolan insists that’s not the reason for his filing Tuesday in Alameda County Superior Court. The filing sets up the next chapter in the drama over 13-year-old Jahi, who has reportedly spent the past several months being looked after at a Roman Catholic hospital in New Jersey, at private expense. LOL Well spotted mung. Clearly they are all perpetrating a running joke? 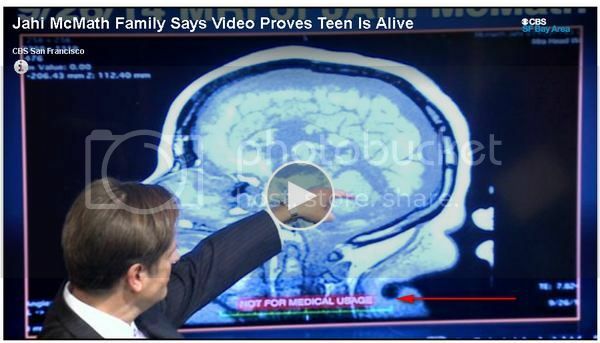 SAN FRANCISCO (CBS SF) – An attorney for the family of an Oakland teenager who was declared brain-dead says he has video proof that Jahi McMath still has brain activity, and is seeking an unprecedented court order declaring her alive. San Francisco Attorney Chris Dolan released the first photo of McMath since massive surgical complications Thursday. On Friday he released video of Jahi moving, and told reporters that doctors at the nonprofit International Brain Research Foundation ran tests at Rutgers University, finding signs of brain function. The video was released during a press briefing Friday where Jahi’s mother, Nailah Winkfield, said she has documented other responsive incidents, and she can differentiate between those movements and spinal reflex. OAKLAND, Calif. (KABC) -- The family of Jahi McMath, the Oakland girl who was declared brain-dead following tonsil surgery last December, says she's alive and they have proof. McMath went into cardiac arrest at the University of California San Francisco Benioff Children's Hospital in Oakland following a routine tonsillectomy to treat sleep apnea. Her family later moved her to an disclosed hospital in New Jersey that agreed to keep her on life support. Nailah Winkfield says her daughter responds to her verbal commands, proof she says that the Oakland teenager is alive despite having been legally declared brain-dead on Dec. 12. A video clip taken by McMath's family shows Winkfield asking McMath to move her arm and McMath responds with a slight movement of her arm. In another clip, Winkfield asks her to move her foot and the girl does. "I always knew cause I'm her mother, and I talk to Jahi, she responds so I said, 'she can't be brain-dead if she's responding,'" Winkfield said. Winkfield and other family members gathered at their attorney Christopher Dolan's office Friday to present what they believe is evidence that McMath is not brain-dead. Dolan says he is working with doctors who say that McMath's MRI shows some brain activity. This is all plain nuts. A Thursday court hearing to decide whether Jahi McMath will be declared “alive again” was postponed after her family said their “team of international brain death experts” needs more time to review a letter from the court-appointed doctor reaffirming his belief that the 13-year-old Oakland girl is brain dead. Jahi was declared brain dead after suffering what doctors said were terminal complications from surgery for sleep apnea at UCSF Benioff Children’s Hospital Oakland in December. Her family rejected the determination, and challenged it in Alameda County Superior court, where they lost. But last week, family attorney Christopher Dolan released video that he said shows Jahi moving her feet and hands at her mother’s request. The video, he said — along with sworn declarations from five doctors who specialize in brain death and injury and who belive Jahi is not brain dead — all bolster the family’s request that the court overturn its initial ruling that Jahi is brain dead. And color me a skeptic but I don't believe Jahi is moving, (even body twitches from the muscles due to the intubation) at least not in the manner that the video show. I think it is a scam, I think the blanket heaped on and around the bed is covering up someone or something, I also think the hand movement was suspicious. And why the hell would she need school clothe's ? People would do better to donate to a local reputable charity in my ever humble opinion. And now the family is saying "No wait" to a court hearing, for what reason? What is Jahi supposed to "rise" from if she is not dead? This business of determining when someone is dead or brain dead is getting so confusing. Not sure what to think about Jahi. Jahi is incapable of posting at Justarse Quest, and so beyond brain dead. An Alameda County judge says he’s inclined to dismiss part of a medical-negligence lawsuit by the family of Jahi McMath, the Oakland girl who underwent surgery for sleep apnea and then was declared brain-dead after suffering cardiac arrest. In a tentative ruling Wednesday, Superior Court Judge Robert Freedman did not address the issue of whether surgeon Frederick Rosen or UCSF Benioff Children’s Hospital Oakland were negligent in diagnosing and operating on the then-13-year-old girl in December 2013. But Freedman said Jahi’s parents could not prove their claim of negligent infliction of emotional distress because they were not in the operating room when the allegedly botched surgery occurred. Freedman also said he was inclined to dismiss a part of the suit that was filed in Jahi’s name, because the county coroner issued a death certificate three days after the operation. The certificate was found to be valid in a January 2014 court ruling that denied the family’s request for further medical treatment. The family has kept Jahi on a ventilator at an undisclosed location in New Jersey, says her heart is still beating and contends medical professionals have confirmed that she is still alive.